Australia's best new crime author”. “Smart. Witty. A cut above." He considers himself a professional police detective. A stickler for getting it right. His trade is non- conforming. Creed is the man you want on your side. He always gets his man or woman. Opinionated. Street smart. Anit-establishment. Focused until the end. You wouldn't want to come up against him. You’ll lose! 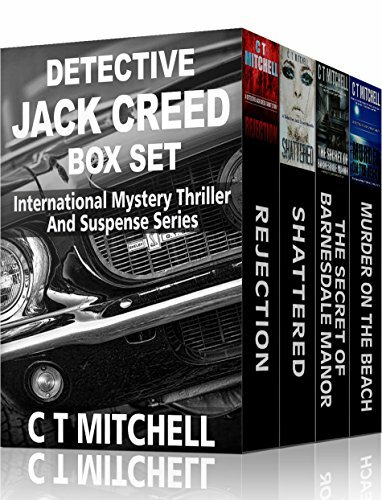 A dead man with ten expensive-looking rings on his hands shows up in an industrial waste bin behind the popular Cabarita Beach Resort, an hour’s drive from Brisbane Australia in the second instalment of the Australian Detective Jack Creed mystery novels. What makes this criminal investigation even more intriguing is the torture on the dead man’s fingers and toes—all broken prior to his death. Australian Detective Jack Creed is immediately on the case seeking criminal justice, but sifting through the myriad of suspects including a battered wife, a recalcitrant son, an ex-lover and a missing secretary—all with secrets to hide—only makes this murder by the sea more mysterious. Will Jack , with all his criminal profiling skills, be able to sift through their lies and figure out this murder mystery, or will the “ring man” keep his secrets beyond the grave? Former Lloyds of London financial whizz Charles Abernathy, the new owner and renovator of Barnesdale Manor, a grand estate located in the serene countryside just outside Bangalow, NSW, Australia, is stunned when he receives a registered letter suggesting he 'looks into things of the past'. The recluse Abernathy is even more miffed about the suggestion he should hold a scavenger hunt at Barnesdale Manor in order to reveal these 'things of the past'. Although he does not know many people in the village of Bangalow, he decides to proceed as it will give him an opportunity to showcase his renovated Manor. Did Charles Abernathy know of the skeleton or is he the murderer playing a silly game. One thing is for sure, to discover things of the past; Detective Jack Creed needs to be called in to solve another Australian crime. Former head of UK’s Royal Bank of Scotland, Nick Turner, is found dead amongst the rocks at Cabarita Beach, a sleepy seaside village on the northern New South Wales coast, Australia. His head caved in by a Honma golf club. Murder on the Beach has Detective Jack Creed up to his armpits in missing millions, illicit affairs, a neglected wheelchair bound wife, a cranky gay staffer and a blonde 'bimbo' mistress - just the sought of case Jack loves.